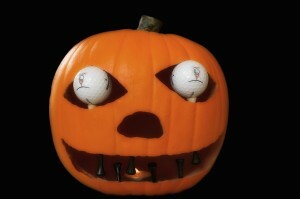 Another golf themed pumpkin for your enjoyment. We used a Funkin artificial pumpkin, carved it out with a Dremel, and used golf tees for the teeth. You aren’t supposed to use a real candle with these, but the fake one just didn’t look as nice for the photograph. Happy Halloween!